In a fluke of nature yesterday we were blessed with a visit of true spring. Since we typically jump from winter directly into the evil throes of summer, spring days are often only a dream. Monday was an exception with a delightfully cool breeze in the morning, followed by a warm, clear, non-humid afternoon. I almost forgot I live in South Texas. 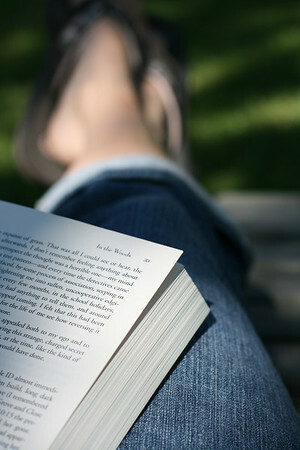 It was pure bliss to sit outside and read without melting or being carried away by those pesky skeeters. Annelise occupied herself with swinging, climbing, neighbor cat petting, digging, ant watching, sandbox playing and cartwheel perfecting, not necessarily in that order. The highlight of the day was finding her very own frog. She named him Eric. 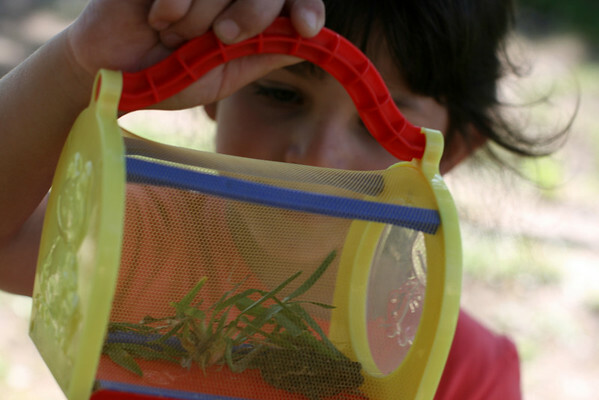 She declared that having a frog was a big responsibility and she was ready for whatever that entailed. This proclamation was followed by grass gathering, frog toting and frog gazing (on her part, he really just wanted outta there). Within about an hour and half of acquiring Eric, and after a little gentle parental persuasion, she decided to let him go free so that he could find the bugs he needed and live a full froggy life. Needless to say Scott and I were quite pleased with her decision. I was thankful not only for the gift of beautiful weather but also for the memories of watching my little girl play her little heart out. And give a piece of it to her frog. Be sure to pop over & visit Chatting at the Sky for more Tuesdays Unwrapped stories. "...and give a piece of it to her frog!"--Brilliant! We've been having some glorious weather here in PA as well...it makes everything right in the world when it's like this outside! Did your daughter get to keep the frog? She really wanted to keep it but decided he would be happier being free. We would have let her keep it for at least a day or two, but were worried it might die and she'd be crushed. She didn't seem to mind letting him go and watching him hop off into the sunset. Or somewhere. Also wanted to add I loved In the Woods! I read it at the beach last month. Shannon: Thanks girl! I bet PA is beautiful this time of year. I hope to see it someday. Angela: Thanks! I like In the Woods so far, I'm just getting into it. Reading it at the beach sounds delightful! Dawn: Thank you about the photo. I took a bunch of shots trying to get it. My neighbors were probably wondering what was going on. i love that! what a great memory from the day. I'm so glad you were given a beautiful Spring day to enjoy and that you took advantage of it by being outside. I think naming a frog Eric is hilarious! I love it when the kids just play their guts out and come inside at the end of the day all dirty and grody--like old fashioned kids of the 50's. THAT'S childhood! this is awesome. and i love that she named him eric!! what a sweet girl to send him out to the world where he belongs.